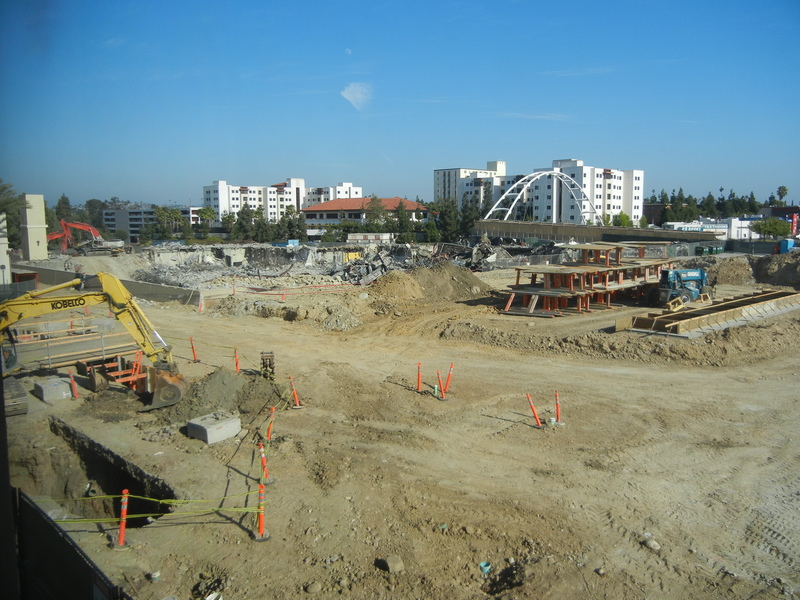 Demolition of the 43-year-old Aztec Center on the campus of San Diego State University concluded this week, paving the way for construction of Aztec Student Union. Aztec Center was designed to accommodate 10,000 students in 1968, and it will be replaced by a sustainable building that will serve 30,000 students. With the main structure down, the construction crew is now processing and separating the demolished materials. Metal, steel, rebar and concrete will continue to be hauled off for recycling. More than 150 tons (300,000 lbs.) of materials was recycled in June, a total that doesn’t even include the concrete brought to a staging area in Parking Lot W waiting to be crushed and re-used for Aztec Student Union. The July totals will be released at the end of August. The elevator tower at the north end of the site will be knocked down soon. Parts of the retaining walls around the site will remain intact for the new building. The laying of the foundation is expected to begin in October and the erecting of steel is slated to begin in February of next year. Scheduled to open in the fall of 2013, Aztec Student Union is designed to be LEED Platinum-certified, the highest rating for green buildings given by the U.S. Green Building Council. It will be the first LEED Platinum-certified student union in the California State University system. Aztec Student Union will be twice the size of Aztec Center and will feature a larger Montezuma Hall, multi-purpose theater, state-of-the-art bowling and games center, a fitness center, Student Organization Center, Student Leadership Center, Cross-Cultural Center, and new dining options. The design elements that will help attain LEED Platinum certification include solar panels to convert sunlight into electricity, a vegetative rooftop to lower greenhouse gas emissions, and underground storm water storage tanks to help conserve water by recycling the water run-off. Roughly 80 percent of materials in the original Aztec Center will be recycled or reused in Aztec Student Union.